True doctrine, understood, changes attitudes and behavior. The study of the doctrines of the gospel will improve behavior quicker than a study of behavior will improve behavior. … That is why we stress so forcefully the study of the doctrines of the gospel. That’s another way of saying something I emphasized in the 1st post: the word of God has power to change people (through the atonement) that far surpasses anything else. So like Alma, I think it is “expedient that [I] should try the virtue of the word of God” (Alma 31:5), before I get into the nuts and bolts of my personal system, which I’ll demonstrate in part 3. 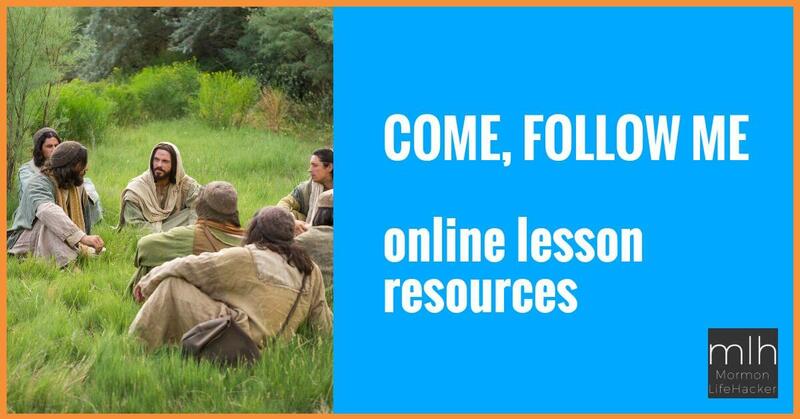 In Joseph Smith’s inspired translation of Matthew, Jesus’ closest followers come to him on the Mount of Olives and ask him to explain to them more about things he’s said about his 2nd coming and the end of the world. Jesus’ first words in his answer are “Take heed that no man deceive you” (JS-M 1:4-5). Then he starts telling them of all the horrible things that will happen before his 2nd coming. He lists false prophets and fake Christs who will trick many righteous people into following them by misleading means or Satan’s power. Jesus also tells of wickedness everywhere, people’s hearts no longer being capable of real love, wars and reports of violent conflict, battles between nations and kingdoms, famine, pestilence, and earthquakes. Christ even tells them that the sun will be darkened and the moon won’t shine; even the stars will fall from heaven. He mentions several times that these trials will be so great that even the chosen will be mislead and unable to handle the challenges given them (JS-M 1:6-36). It sounds pretty frightening doesn’t it? Christ is consistent though, and doesn’t leave them, or us, without hope or without the knowledge of how to survive. He provides a simple key to spiritual survival in all times: “And whoso treasureth up my word, the same shall not be deceived,” (JS-M 1:37, emphasis added) and assures them that he’ll return and gather those who are not deceived to him. Now think about that for a moment. Think about all he didn’t say. He didn’t say: whoever prays the longest, or whoever says the most prayers. He didn’t say whoever puts in the most service hours or goes the longest without missing church. He didn’t say whoever holds the most prestigious callings in the church, or who can quote the most scriptures from memory, or pays the most tithing, or gives the best talks. None of those things will ultimately have power to protect us from Satan’s deceptions, by themselves. 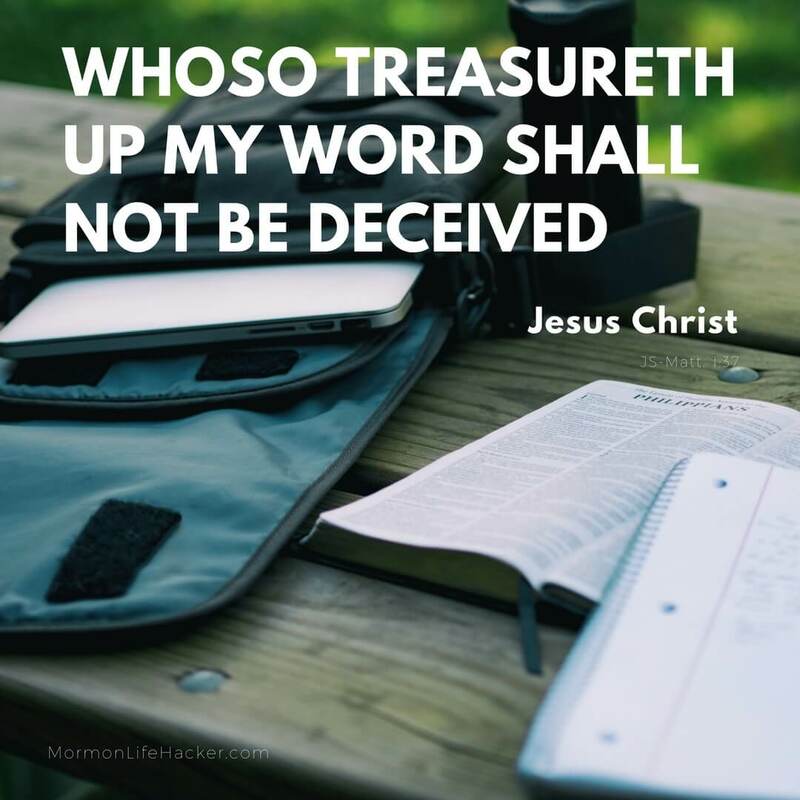 What he said was “whoso treasureth up my word.” Those who study the scriptures and the doctrines, they are the only ones who will be able to withstand the attacks and temptations of the world and the devil. Don’t get me wrong: many of those things Christ did not say are good or even great things. And someone who’s treasuring up the word and thereby becoming fully converted and truly Christlike, will automatically do many of those things. But they won’t be taking a tally, or putting their score on a spiritual leaderboard, or comparing their own record to that of other people. They’ll simply do them, as Christ would. I love that Christ gives such a plain truth here: the one key to spiritual survival in all times, is studying the scriptures and the doctrines taught in them. If we treasure up Christ’s teachings and doctrines, He will send spiritual protection and peace that will get us through even the worst of times. …we have not been using the Book of Mormon as we should. Our homes are not as strong unless we are using it to bring our children to Christ. Our families may be corrupted by worldly trends and teachings unless we know how to use the book to expose and combat the falsehoods…. 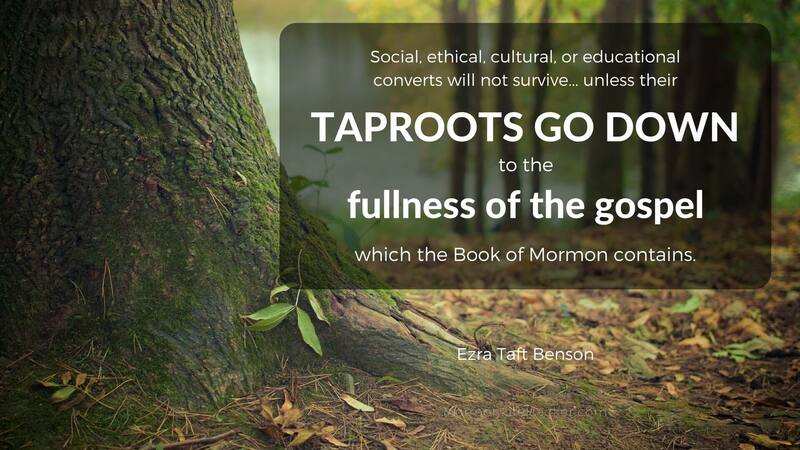 … Social, ethical, cultural, or educational converts will not survive under the heat of the day unless their taproots go down to the fulness of the gospel which the Book of Mormon contains. Our Church classes are not as spirit-filled unless we hold it up as a standard. I referenced Elder Bednar’s talk “A Reservoir of Living Water.” In it, he broke down some important symbolism, and the lesson we learn from it, in Lehi’s dream. In that vision (1 Ne. 8), there’s 3 groups of people who enter the straight and narrow path that leads to the Tree of Life, which is representative of Christ. This means they’ve joined the church, including being baptized and receiving the Holy Ghost. The first group doesn’t grab the iron rod, and they get lost in the mists of darkness, which represent the temptations of Satan. Since we know the iron rod = the word of god, we know they might have joined the church (or were raised in it), but they never treasured up the word, and so never felt the changing power that comes through the study of the gospel. They never saw the value in scripture study, or realized just how much power was available to them through it. A 2nd group finds the iron rod and clings to it, until they make it to the tree and partake of it’s fruit. However, when they’re mocked by the people in “the great and spacious building” (the world), they’re ashamed to be associated with Christ (the tree) and wander off. So here’s a people who are members of the church, and they at least read the scriptures. They cling to the word of god just enough to feel the influence and power of the atonement in their lives. However, they don’t truly appreciate it and study it regularly. And so they only partially benefit from the power of the word. They’re easily “tossed to and fro, and carried about… by the sleight of men, and cunning craftiness…” (Eph. 4:14). They once appreciated the doctrines, but when the world mocks them, it’s easy to see the scriptures as either a hoax played out on them, or maybe as just “a good book” that might have moral value, but is not the literal word of God. 24 And I said unto them that it was the word of God; and whoso would hearken unto the word of God, and would hold fast unto it, they would never perish; neither could the temptations and the fiery darts of the adversary overpower them unto blindness, to lead them away to destruction. …the preaching of the word had a great tendency to lead the people to do that which was just—yea, it had had more powerful effect upon the minds of the people than the sword, or anything else, which had happened unto them—therefore Alma thought it was expedient that they should try the virtue of the word of God. Over and over the scriptures and the prophets teach us that if we are worthy and keep our covenants, we have a right to personal revelation and the companionship of the Holy Ghost. They also teach that more “light and truth” are available to us, if we seek after them. The other day my little girl asked me “Daddy, why were part of the gold plates stuck together?” (Ether 4:4-5) I tried my best to explain that one of the reasons is that it’s a symbol that there is much more for us to learn. 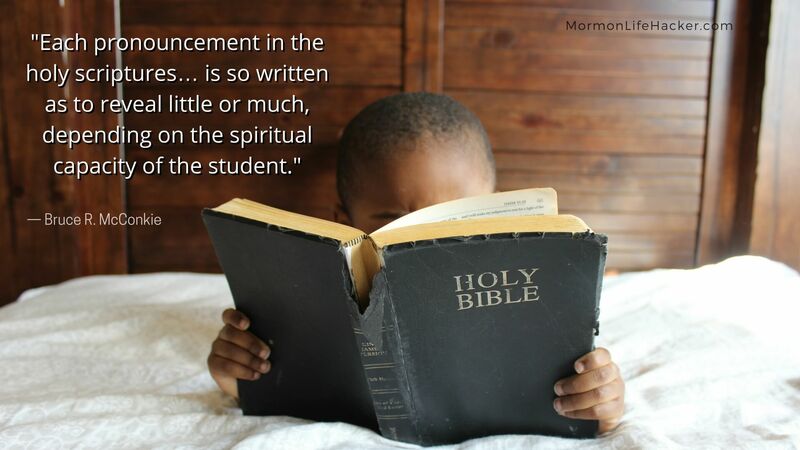 But since the rest of the Book of Mormon was sealed, we can only learn it through studying the scriptures we have, and then live worthy so the Lord can teach us more. He’s promised he will teach us the things that are in the sealed portion of the plates, if we do our part to be worthy of those revelations. On another occasion, he said: “I sometimes think that one of the best-kept secrets of the kingdom is that the scriptures open the door to the receipt of revelation” (Doctrines of the Restoration, ed. Mark L. McConkie, Salt Lake City: Bookcraft, 1989, p. 243). It’s that simple: we covenant that we “may always have his Spirit to be with [us]”. The way to invite it into our lives and live up to that covenant, is through scripture study. …one of the most important things you can do as priesthood leaders is to immerse yourselves in the scriptures. Search them diligently. Feast upon the words of Christ. Learn the doctrine. Master the principles that are found therein. There are few other efforts that will bring greater dividends to your calling. There are few other ways to gain greater inspiration as you serve. But that alone, as valuable as it is, is not enough. You must also bend your efforts and your activities to stimulating meaningful scripture study among the members of the Church. Often we spend great effort in trying to increase the activity levels in our stakes. We work diligently to raise the percentages of those attending sacrament meetings. We labor to get a higher percentage of our young men on missions. We strive to improve the numbers of those marrying in the temple. All of these are commendable efforts and important to the growth of the kingdom. But when individual members and families immerse themselves in the scriptures regularly and consistently, these other areas of activity will automatically come. Testimonies will increase. Commitment will be strengthened. Families will be fortified. Personal revelation will flow. …You must help the Saints see that studying and searching the scriptures is not a burden laid upon them by the Lord, but a marvelous blessing and opportunity. Elder McConkie assured us that people of all ages and spiritual levels can benefit from the scriptures. “Each pronouncement in the holy scriptures … is so written as to reveal little or much, depending on the spiritual capacity of the student” (A New Witness for the Articles of Faith, 1985, p. 71). The scriptures testify of Christ. Learning of Him brings us closer to Him through the Spirit and His atonement. Putting Christ first is the most important thing we can do. According to his own teachings, studying the scriptures is the #1 most powerful way we can put him first, and ensure that we’re partaking fully of His “grace that so fully he proffers [us].” I know from my own experience that this is true. This is how and why scripture study changed my life, when things were not going well spiritually. The really awesome part is that it’s not just a one time boost to get out of the spiritual pit I was in. As long as I keep treasuring up the word, I’ll continue to grow as Christ and his atonement work through the Spirit to change and bless me. I just have to continually hold fast to that rod of iron. What can you do (through Christ)? Great post, thank you for sharing! This definitely builds on your previous one. I started following your recommendations and they really helped me stop gliding through verses. 20 minute study sessions are richer and I’ve felt closer to the spirit. Thanks for letting me know Dan. If you benefited from it, it’s worth all the effort to put the posts together. I’m so glad it’s helping you. It’s been such a huge blessing for me. Hi Tevya – will there be a part three? Yes! There certainly will. I’ve got one portion of it finished, but just been super busy with a number of things. My goal is to post it before the end of the year though. That’s encouraging Steve! I’ll try to work on it soon. Good to know about those issues you face. I’m not sure my way will help directly, but since you mentioned it, I’ll try to include some ideas specifically for tablet-use. Thanks for sharing your study techniques. Will there be a part 3? As I said to Steve, there is a part 3. Coming (hopefully) before the end of the year! I wish you would make more of a point about being born again and studying the scriptures by the Spirit. There were many scribes in Jesus’ day who knew the scriptures by heart. In their mind, they had treasured up the words of God in their heart. Today there are some who do the same thing. They are scholars, and because their minds are so filled with scripture and focused on scripture all the time, they think they have the word of God treasured up in their heart. But they aren’t born again. Or if they have been born again, they have swapped out the Holy Spirit for a very clever demon that imitates a natural hunger for God’s word – but in a scholarly form instead of a humble follower of Christ form. We must be born again before the true meanings of scripture passages are even clear to us. Check out JS-H 1:71-74. Joseph had seen all kinds of visions and had even translated the whole Book of Mormon, but it was not until May 1829 that he was baptized by the Holy Spirit as he came up out of the water. Neither he nor Oliver needed to receive it by the laying on of human hands, but they got it the same way that many in the Book of Mormon and in the New Testament did. Straight through the veil. And afterwards they could understand all kinds of things that had never occurred to them before as they read the scriptures. We are not to teach unless we have the Spirit. And we are really handicapped at treasuring up the word of God in our hearts if we don’t do it by the Spirit. When you talk about the rod of iron, Tevya, you fail to mention anything about the narrow gate of being born by the Spirit. You fail to mention that the rod of iron extends out into the great and spacious field. That’s where we first discover it and start reading the scriptures – is when we are still in the world. There are many people who spend their whole life petting the iron rod or patting it like it’s a dog. They keep their hand on it their whole life long and never move out of the great and spacious field. They do not let it lead them to the narrow gate where they can be born again. So I like your main point. But I fear that some people will take away from this that they will be just fine if they do as the scribes and Pharisees of old did. I find it ironic that you talk about treasuring up the words of eternal life in our heart while failing to mention the narrow gate which scriptures are designed to lead us to so that we can actually begin to understand them and treasure them up in our heart for real. It’s as though you assume that simply reading them passionately is enough to put us on the narrow path. In my experience, most people who think they are on the narrow path are actually walking on a safe grassy loop that Satan has mowed into the tall grass of the great and spacious field. They go in monotonous circles. But they are happy and they can walk abreast with their “eternal family” as they follow their leaders, linked arm in arm. And these same people, many of them, study their scriptures religiously. They think they are on the true narrow path. They think they are treasuring up words of eternal life in their heart. But they are not actually born again. They have not actually passed through the narrow gate with a mighty change of heart. Their path is neither neither perilous nor especially arduous. The 1828 Webster’s definition of “strait” as it is used by Nephi to describe the narrow path does not mean what we think it means. With that spelling, the word means “intimate” first and foremost. When we pass through the narrow gate, be literally become Jesus’ spiritual offspring. We stop being just a creation, and start being his family. Thus, the narrow path is a path of intimacy with Jesus. It is wide enough only for a single person and the Spirit of God. We must become new creatures and children of Christ (not just with our lips, but through to our core) to have any hope of truly treasuring up the words of eternal life in our heart; for we really do not know God intimately until we are on that narrow path. And we cannot get on that path without going through the narrow gate, which is to be born again. Only Jesus can give birth to us in this way. He is the only one who baptizes with fire and the Holy Ghost. He is the only keeper of this narrow gate. And he is the sole possessor of the Lamb’s Book of Life. Whom he baptizes with fire he gives birth to. And whom he gives birth to gets their name in his Book of Life. And if they continue to the end with steadfast faith in Jesus alone, their name will stay there and not be blotted out.